Yesterday morning, as I was pulling a bowl of blueberries out of the fridge to add to my pancakes, I accidentally tipped the bowl and sent them skittering across the kitchen floor. As I was crawling around on my hands and knees retrieving them all, I was struck by how simply pretty they are. So today, my favorite thing is the little powerhouse of taste and beauty.... the blueberry! *The blueberry is the largest fruit crop produced in Canada, occupying more than half of all fruit acreage. *Nova Scotia is the largest wild blueberry producer in Canada, and has thus bestowed upon the berry the title of "Official Provincial Berry". 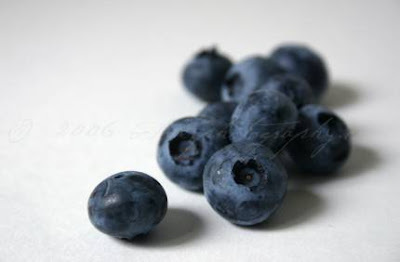 *Blueberries are a nutritional super food, containing piles of micro-nutrients and antioxidants. They are said to be helpful in reducing one's risk of cancer, reducing inflammation, slowing the cognitive decline of Alzheimer's, and may lower cholesterol. * Blueberries add instant flavour to pancakes or muffins; are sweet in a pie or stewed into a jam; and, they make a wicked summer gelato. What's not to love about the blueberry? Photo is by octoberphotography, and can be found on etsy.